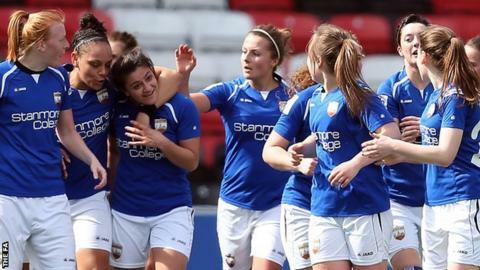 Promotion-hopefuls Yeovil Town were held to a costly 2-2 draw by London Bees as Women's Super League Two's front-runners Doncaster Rovers Belles and Reading claimed big wins. Andria Georgiou came off the bench for the ninth-placed Bees to level for a second time after the break. Doncaster maintained their place at the summit with a 5-0 win at bottom side Watford, while Reading beat Oxford 4-0. Everton moved to within five points of Yeovil with a 4-1 win over Millwall. The Toffees, who moved up to fourth following Aston Villa's home loss against Durham, still have two games in hand on all sides above them in the table. However, pacesetters Doncaster are showing no signs of slowing down in the league as they netted five goals for the third consecutive league game. Beth England and Courtney Sweetman-Kirk both scored twice and Sue Smith completed the easy win to keep the Belles three points clear of Reading.